Symbiosis Law School, Pune, and Gujarat National Law University, Gandhinagar seal their place in 28 September final. Pune: From who started the concept of formal economic planning in India to listing out prime ministers who have completed full terms, and identifying countries that have sent secretary generals to the United Nations, two students from Pune’s Symbiosis Law School answered it all and cruised to victory in the western region round of ConQuest. The third edition of ConQuest, India’s premier national quiz on the Indian Constitution, history and politics, is being organised around the country by the Centre for Law and Policy Research (CLPR). The winning duo, Karan Kamath and Amey Pilay, are also the defending champions of the quiz, having won ConQuest, 2017. They won in Pune Saturday to a standing ovation not just from the audience, but also the other participating teams. The second position was won by Gujarat National Law University, Gandhinagar. Both teams have now qualified for the final, to be held 28 September at the School of Law, Christ University, Bengaluru. A total of 60 teams from colleges across Maharashtra, Goa and Gujarat participated in the western region round, which involved a written preliminary quiz as well as on-stage rounds. The quiz is aimed at engaging the youth with India’s rich constitutional and political history. CLPR drafts the quiz questions in association with Walnut Knowledge Solutions, a Bengaluru-based quizzing company. The questions go beyond textbook knowledge to take into account some of the most crucial social and political issues of our time, as well as those that have shaped India’s politics through the years. In the context of questions in the quiz on suffragettes and the right to vote, he added that voting was a duty that we neglect, as a result of which democracy fails. It is important to have a thorough understanding of our rights and duties under the Constitution and an active engagement with politics, policy, the law and governance to have a well-informed and impactful voter base. As digital partners of ConQuest, ThePrint not only supports the aim, but also independently works towards it through focused reporting on similar themes. 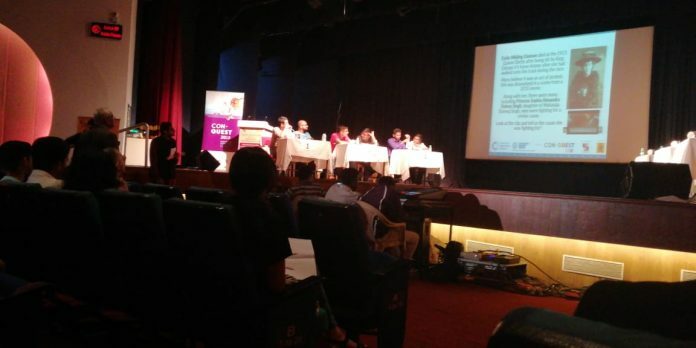 Much to their amusement, the audience Saturday learnt that Article 377 actually deals with provisions pertaining to the Comptroller and Auditor General of India. Students were also questioned on the outcome of Pune resident Tushar Damgude’s complaint in connection with the 1 January Bhima-Koregaon violence that led to the arrest of 10 activists known to dissent with the state, and the fine print of Mumbai nurse Aruna Shanbaug’s euthanasia judgment. A question that all contestants and even some members of the audience struggled with was the reference to a vehicle registration number in one of the scenes of the Rajinikanth-starrer Kaala – MH01 BR 1956. The correct answer ultimately came from a member of the audience. The reference was to the year in which Dr B.R. Ambedkar converted to Buddhism. Some other questions that contestants had to tackle were the meaning of Mughal Emperor Akbar’s ‘Tarkh-e-Elahi’, the name of the Indian Army’s first all-women regiment, first Cabinet members of Independent India, and India’s women constituent assembly members.